Chowder is any of a variety of soups, enriched with salt pork fatback and thickened with flour or more traditionally with crushed ship biscuit or saltine crackers, and milk. To some Americans, it means clam chowder, made with cream or milk in most places, or with tomato as "Manhattan clam chowder." Left: New England clam chowder. 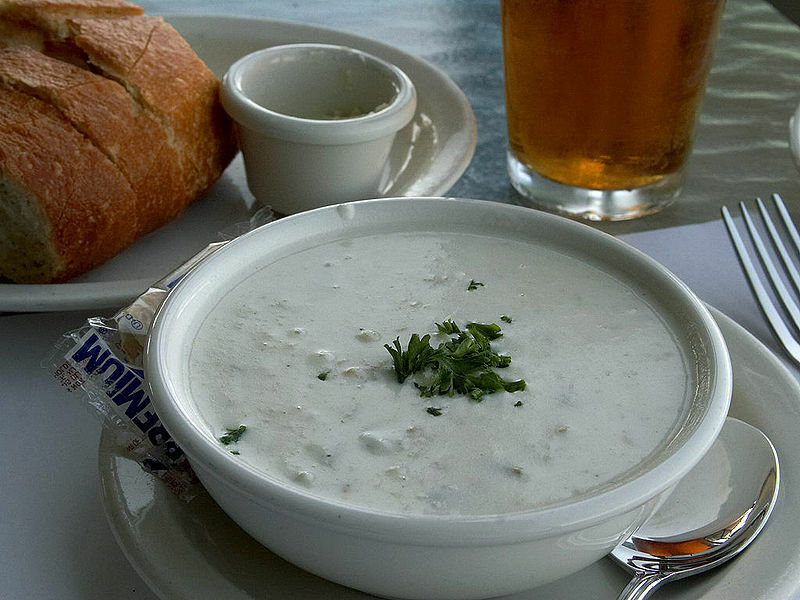 It is believed that clams were added to chowder because of their relative ease to collect. Along with the clams, diced potato is common, as are onions, which are occasionally sauteed in the drippings from salt pork. Celery is frequently used. Other vegetables are uncommon, but small carrot strips might occasionally be added, primarily for color. A garnish of parsley serves the same purpose. Bay leaves are also sometimes used as a garnish and flavoring. New England clam chowder is a milk- or cream-based chowder, traditionally made with potatoes, onion, bacon or salt pork, flour or hardtack, and clams. Adding tomatoes to clam chowder was shunned, to the point that a 1939 bill making tomatoes in clam chowder illegal was introduced in the Maine legislature. 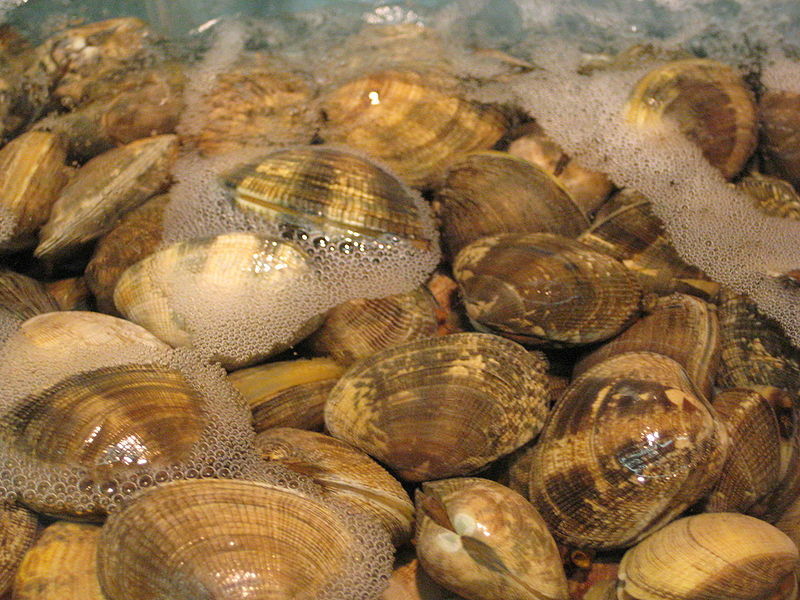 If using frozen clams, drain and reserve liquid. Cut hard parts away and keep them separate. Sauté salt pork in a heavy iron pot until brown and crisp. Remove pork and sauté hard part of clam and onions in hot fat until onion is light brown. Stir in flour, then slowly add boiling water, salt, pepper, and diced potato. Cover and simmer gently 10 minutes or until potato is tender. Add soft parts of clams and liquid. Just before serving, stir in scalded milk and butter. Heat thoroughly, but not to boiling. Serve piping hot with oyster or soda crackers.